Did you wake up this morning with an urge to replace the boring old wallpaper on your desktop ( laptop, tablet, et cetera) with something a little bit more exciting? Perhaps you were looking for something you might describe as really, ridiculously good looking (in the manner of Derek Zoolander), but also something that shows off your love of cool technology and of human spaceflight? Well, you are in luck! 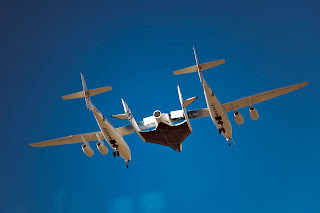 This morning, the VSS Enterprise--the first SpaceShipTwo vehicle, the successor to the Ansari X PRIZE-winning SpaceShipOne took to the skies for the first time as part of a captive carry test. This was no space shot, but rather a test flight to show how the mated pair of the Enterprise and the VMS Eve (the WhiteKnightTwo mothership that acts as her first stage) would behave in the air. And wow do they make for a beautiful sight! You can find a full gallery of photographs from today's test flight here. Congratulations to the Scaled Composites, Virgin Galactic, and SpaceShipCompany folks for reaching this impressive milestones! Here's to many more beautiful photos of these two vehicles.